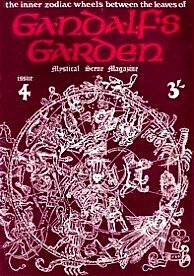 This short-lived 'underground' magazine, edited by Muz Murray and illustrated by John Hurford and others, dealt with 'mystical interests' and promoted meditation in preference to drugs, first appearing in May 1968 and surviving for only 6 issues. 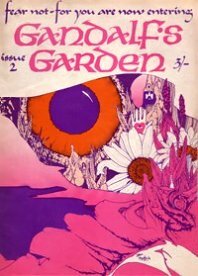 Like the other 'underground' magazines of the time, such as OZ and IT (International Times) it was produced in colour, but used pastel shades, with crimson or burgundy text, rather than the riotous, psychedelic colour combinations preferred by the others. The letters page was titled 'Seedbag' and a page of press cuttings was called 'Oh to be in England'. Some famous contributors to the publication were Spike Milligan, Joan Baez, Christopher Logue and Adrian Mitchell. 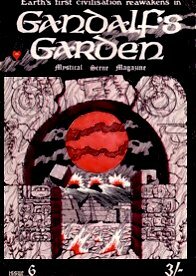 The inside page of issue 1 stated 'You are now entering Gandalf's Garden-fear not' and the introductory editorial by Muz Murray stated: "Gandalf's Garden is the magical garden of our inner worlds, overgrowing into the world of manifestation. 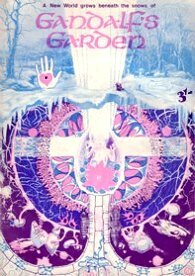 Gandalf's Garden is soul-flow from the pens of creators - mystics, writers, artists, diggers, delvers and poets, a wellspring of love and anguish that those with searching thirsts may drink thereof. As in the Stone Gardens of the Orient, where Soul Wizards sit within the stimulus of their own silences, contemplating the smoothness of the million pebbles, so should we seek to stimulate our own inner gardens if we are to save our Earth and ourselves from engulfment"
Comprising about 30 pages per issue, it failed to achieve the sharp-edged notoriety, or indeed circulation of the other publications, being far more gentle and advocating peace and meditation rather than political agitation and, in the extreme, 'terrorist' activities. 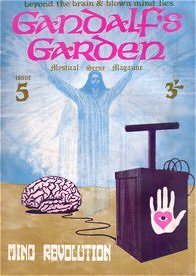 Articles included features on Glastonbury, Aleister Crowley, the Selene Community in Wales, the Krishna Commune, Tyrannosaurus Rex, The Third Ear Band and Quintessence. Among many adverts included were Middle Earth (Captain Beefheart and The Fugs), Oz Magazine, IT, and Splash Posters. 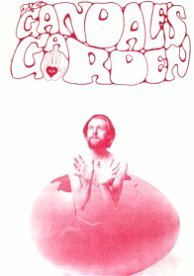 The Chelsea location of its physical manifestation, 'Gandalf's Garden', had closed by 1972 and original issues of the magazine have become collector's items worth up to £100 each. A new world is emerging in the spirit of the young as this planet hurtles into the vibrations of the year 2000. A world which has become afraid to love the stranger is opening to the sun. The wellspring of youth is tapping the soul of the earth and love for humanity is bubbling into recognition. Love is incorporated in everything. In everything we have to say. Even when we cry out against malpractice and injustice. For anger is only hurt love frustrated. That is, normal human love prevented by outside circumstances from existing continuously in its natural flow. The harmony of living life beautifully is too often disrupted by violent trespassers in one's own cocoon of gentleness, by blunted wedge-shaped minds and feelings being driven into one's daily life at random. Such noisy picnickers of the soul are those unable to recognise another's world, or know their own, and thus they thrust their insensitivity into others, leaving in their wake a rash of harmful garbage. The condition whereby one lives ceaselessly in that frame of feeling which our finer moments give us, is not impossible to attain, as witness the divine joy which radiates from holy men and meditators who have reached this level. And it is thus being prevented, by the kind of world we have grown into, from living in such a state, which brings about a jarring disharmony in life in general, as well as in one's own being. For the nature of the indefinable 'essence' of the cosmos is love, and we are at variance with it. Some set up barriers to progress in soul exploration by naming the unnameable as Jehova or God; Brahman or Allah or Tao; the Universal Soul or the Absolute Principle. The Arabic phrase God is Love is a good point from which to begin a soul journey, rather than to be stopped dead with the finality of God is. For the mysteries and complexities of the whole interlocking harmony of life and death on our and other worlds are too vast to confine by one word as an answer to it all. And its power and wonder is manifest in ways which are communicable to us all, in a myriad forms of love and shades of loving. It lives within us and about us also. Like air or ether, it is another of the elements. The element of the human spirit. The element of the animal, vegetable and mineral spirit. Ignore it, prevent it giving expression, or attempt to destroy it within us, and we become prone to mental and physical sickness, hatred, derangement or emptiness. Love frustrated is as breathless as a landed fish. But how does one tune in? How does one begin to contain that love? To feed one's own roots? To explore the inner universe and being to feel the affinity between one's self and the secrets of the cosmos? One must take the first faltering steps of learning to walk in another dimension. Look deep into the chalices of flowers, study them, observe the natural world. Find your way to woods and fields whenever possible. Lie amid the grasses. Live again the smells and sights and sounds of childhood when the world was truly beautiful and you were nearer knowing what it was all about. Your perceptions were closer to the core of all 'being' then, unclouded by mis-education and the intellect. Except that ye become again as little children, ye will not enter the 'kingdom of heaven', which kingdom is in fact, the here and now 'union' of the perceiving love force within and the love vibrations without from everything in that element in which all exists. Bookworm away into the habits and peculiarities of all living things: plants, insects, animals, birds, trees, rocks, seas, clouds, etc., and the microcosmic world of creatures dwelling in the human body; and therein the incredible harmony of all growing, breathing and supposedly inanimate things will be revealed to you. Such insights into the workings of living organisms may open endless fields of thought. From tiny facts, mundane to naturalists and students of biology, can grow new revelations, for seekers on the frontiers of soul-expansion. Let us take the fox-glove for example: inside each flower bell grow protective hairs to prevent random insects from pillaging the honey sacs, but the pollinating bee has the needed strength to push aside the hairs and exactly fits the bell, hung downwards, affording protection from enemies above and trapping warm air rising. Thus the innate consciousness of the plant presupposes the existence of the bee. As in the same way the white moth flowers which only open and give off scent in the night, presuppose knowledge of those insects which only fly by dark. Certain trees which have no means of transporting seeds to other pastures have pre-knowledge of the birds which will eat the berries it produces - for though the outer pith provides the bird with nourishment, the seeds lie encased within a protective sac which is insoluble in the acids of a bird's digestive system. Thus the bird flies on and so excretes the seeds to grow elsewhere. These things are but the beginnings of understanding. The ultimate is what the eastern delvers term yoga meaning 'union', or samadhi - the bliss of divine 'kingdom of heaven' perception. Everything is connecting, inter-penetrating, bound in a 'oneness' of purposeful being - in a unity which is love manifest. By such realisation Man can feel his place in the cosmic order. The perceptive being can sense the corresponding love between the spirit-self and all things when totally absorbed head and soul in a pastoral scene, a seascape or a country night sky. For a landscape to be green, each blade of grass and leaf alone has to be green and growing in itself. For a society to blossom and become fruitful, each individual member of that society must be alive and growing within. Those who are not cultivating their inner world become deadwood. Deadwood breeds parasites. Parasites breed futility. Without green and growing individuals society is nothing but deadwood. There is no such thing as the State. What actually exists is the individual. The single mind. You. If you are not generative from the wellspring of your being, then you are not creating the world you would live in. For your scene to be a pleasure to live in, for your society to be beautiful, the onus is on each and every individual to be involved, fruitful and growing. Remember, this is your world too. Contribute to it. SPREAD LOVE.